Blue House Roundabout and Jesmond Dene Road – where is the cycling? A public outcry in response to their Blue House roundabout plans forced Newcastle Council to go back to the drawing board. To the council’s credit they have gone back to basics. Newcastle council invited local groups to discuss what should happen here, and to discuss the impact these decisions will have on a future Newcastle. A representative from the newcyling’s Committee has attended all of the Blue House roundabout working group meetings – this is five meetings to date. A number of designs have been examined (see www.bluehousegroup.org) and they have prompted lengthy discussions. Although the groups agree that the council has not made a strong case for the need to expand the capacity of the current junction for private motor traffic, and that other modes of transport should be made more convenient, time and time again we have been shown plans which prioritise motor traffic, marginalise walking and completely disregard the inclusion of quality cycling provision. We were reminded at the last meeting that we must also remember the importance of considering the views of those not represented in the room who want to drive on this route. We think that the council needs to provide evidence of these views, as in the consultation report (pdf) only 3% of respondents said that increased journey times were a positive factor of the proposed design, despite 90% of respondents registering that they travelled by car here. We would like to highlight to the council the importance of making evidence-based decisions. Is Newcastle Council being ambitious enough? It is essential that the council starts planning for the future. We are facing big problems such as climate change, air pollution due to vehicle emissions, obesity and other health and social inequalities, all of which can be mitigated through getting more people out of cars and active. Building in cycling into our transport system is crucial in achieving this. In addition, creating a more liveable city can make our city more attractive as a place in which to live, work and play, attract businesses, and boost the city’s economy. We believe that the business case for these changes should be open to public scrutiny. We would like to see calculations of costs and savings for various options presented in an open and transparent format. This should not just include congestion related factors, but also public health and safety considerations. By only focusing on congestion and journey time savings we are missing a big part of the picture. Newcastle is currently failing to monetise the health benefits of cycling infrastructure (see for example here (pdf)). We need to remedy this so that can we make informed decisions about the best course of action for a better future for Newcastle. We would like to see evidence that the council is being as aspirational as possible when it puts together its business case. There would appear to be room for manoeuvre in NECA’s Transport Assurance Framework (for example here (pdf)) and we would like to know the degree to which we can influence the proposal while staying within the parameters of this framework. What is in this for cycling? Here are the two drawings produced at the most recent meeting. Can you see anything for cycling? Provision for motor traffic is clearly marked on every drawing but it is not so easy to see how the walking and cycling routes work. There have only been verbal descriptions of these, which is why we question Newcastle Council’s commitment to taking on board concerns raised in the consultation (see here (pdf)). These drawings don’t send a message that cycling is important. We’ve been told that cyclists could potentially be allowed to cycle on the grey areas which are currently footpaths. This puts cycling directly next to the fast and busy carriageway on a narrow path with no buffer. 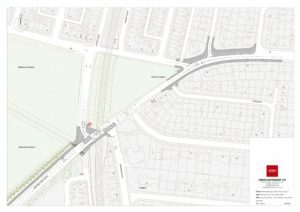 There are no crossings to the south or the west of the roundabout – how will cyclists get to or from the south west corner? Have council consulted the relevant design standards such as LCDS or IAN195/16 that prescribe buffers for example? This would allow them to establish whether there is enough room to fit cycle paths in these areas. We have been told that the yellow tracks on the moor are footpaths, but are not tarmac paths. The changes introduced on City Stadium have shown that if the surface is not smooth many pedestrians will choose to use the cycleway instead (think prams/buggies, wheelchairs, or just the extra effort required to walk on loose or uneven surfaces). Pedestrians also have to cross the road in two stages because the movement of motor traffic takes priority. Presumably the cyclists and pedestrians would have to share these crossings, which are also poor for accessibility and comfort. 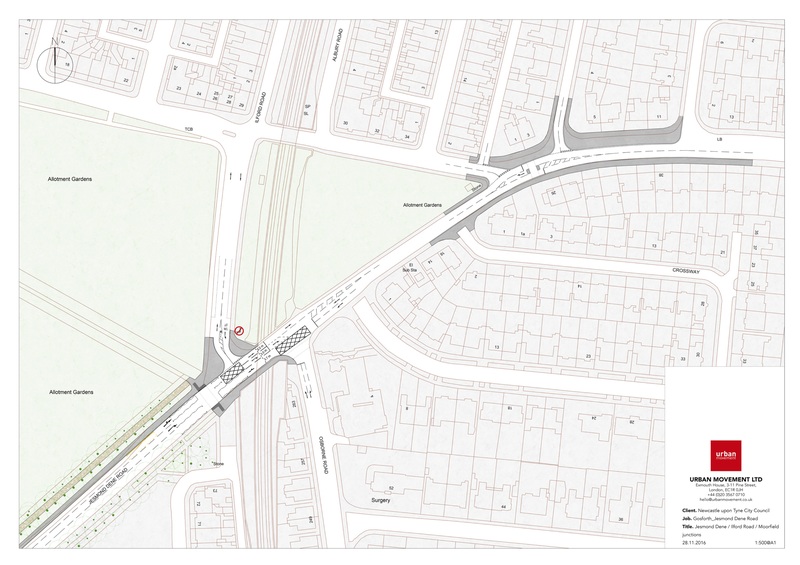 There is no provision at all for cycling on the plan for the Jesmond Dene Road/Osborne Road junction and therefore no indication of where cyclists are supposed to go once they have left the Blue House roundabout. This council has committed to getting more people cycling, but the lack of joined up thinking doesn’t give us confidence that they are taking this commitment seriously. All in all it looks like cyclists and pedestrians are expected to share pavements and inadequate crossings. We don’t believe that this approach will attract many new cyclists or that existing cyclists will be tempted to use safer infrastructure rather than continuing on the road. There is nothing like a drawing to show where priorities lie. Where is the cycling Newcastle Council?